We have provided a variety of business or personal website design packages that we believe will fulfill a wide range of size, use, and budget needs. Pre-designed Templates vs. Custom Designs. We, of course, recommend the custom designed sites as there is no substitute in a very competitive marketplace for personalization, name recognition, and branding. However, the Pre-designed site packages are readily available, save you time, and are specifically offered for a more limited budget while providing the same flexibility of features and functionality. Our quality is consistent throughout our Packages—we maintain the same level of technical excellence on ANY site we build. 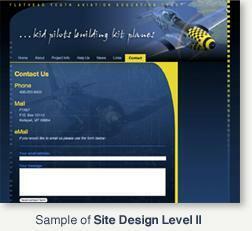 We have two pre-designed site packages based on the currently available Pre-designed Templates. Choosing one of our Pre-designed Template options eliminates the initial site design cost at the onset, which both saves you money and decreases the turn-around time of your site, while still allowing the use of any of our Standard Features for your content. You are never locked into a Pre-designed Site Package as you can upgrade at any time to one of our Designer Site Packages for the difference between your current package and the Designer Site Level you wish to upgrade to. No extra fees or penalties. The Basic StartUp Site is a great solution for “just getting online” or advertising a product or products. 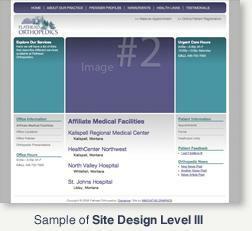 This site option includes basic pages, links, menus, contact form, photos, and google maps. Audio and video embedding are availble as needed. This site option is limited to 6 pages of content. Upgrading from a “StartUp” site to another package allows you to login and edit your own site. If you need access to our CMS to maintain your own site content, you will need to upgrade to a non-StartUp site package. A great option if you are on a budget, but still need a fully functional and expandable professional site with any combination and unlimited usage of our standard feature set. This site provides truly the best value in our line-up, as with it, for under $1000, we can get you into a professional site that is truly a dynamic, feature-packed, website solution with CMS for your individual or corporate use. All of our Custom Site Packages include personalized, professional design services which allow you to express to the world the uniqueness of your company’s product and services. In your site header we will creatively design your logo, title, slogan, images and most any creative ideas you have! A personalized website using any combination and limited usage (6 pages) of our standard feature set with a custom header design and custom site colors based on the Standard Site Structure as shown in the sample site to the right. A personalized website using any combination and unlimited usage of our standard feature set with a custom header design and custom site colors based on the general header-content-sidebar layout of the Standard Site Structure as illustrated in the example site to the right. If need more design flexibility than just customizing your site header, please consider upgrading to Designer Site Level II or III. We can create a fully customize design for your site based on the general header-content-sidebar concept of the Standard Site Structure.You have unlimited usage of our standard feature set as in Level I. The look and feel of your site can be completely unique while still maintaining the basic layout of our Standard Site Structure, allowing you to freely personalize your website. 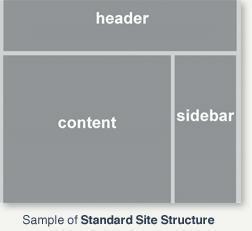 If you wish to deviate completely from the Standard Site Structure, please consider Designer Site Level III. To take your site a step further, we can tailor a fully custom site structure to meet your specific wishes for functionality and design, developing a custom template that is completely unrelated to our Standard Site Structure, as in the example. Just give us a link to a site similar to what you like, or send us a sketch of the general layout, and we will develop your site with that structure. Price varies depending on required parameters and complexity of request. No matter what site package you choose, please contact us with your site requirements to get a complete, itemized website proposal. This will allow us to include any variations or custom requests you may have for the particular site you desire to develop. You may also contact us if you just want to give us your ideas for a site, and we can get you a custom proposal for any site you have in mind. Please be as detailed as possible. 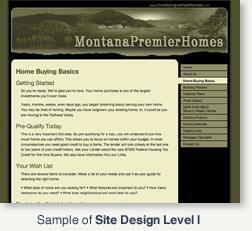 Please fill out the custom quote form or call us with your site requirements to get a personalized website proposal.